Each step on each card shows what to do, which numbers to work with, and where to put the answer. Fantastic! ** Reasonably priced at only $2.00 each - with FREE shipping on Math Cue Cards!! ~ Adding with carrying in 3 clear, short steps. ~ Subtracting with regrouping in just 4 clear, short steps. ~ Transfer from standard to scientific notation. Teacher, you can now stop repeating yourself. 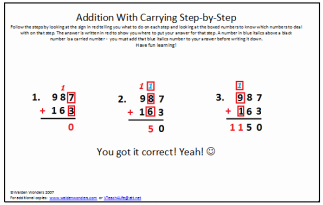 These Math Cue Cards do the re-teaching for you! Teach the procedure, teach the card, provide the card to the student, remind them to use it. Awwwww, nice.